Disclaimer: My personal views expressed here have not been reviewed or approved by anyone else. The last time I saw the unemployment rates they were for February 2009. They were United States 8.1 %, California 10.5 %, Riverside / San Bernardino / Ontario Metropolitan Statistical Area (MSA) 12.2 %, San Bernardino County 11.9 % and Riverside County 12.6 %. As a San Bernardino County employee I work at an Employment Resource Center in a resource room with about 40 computers helping unemployed and underemployed job seeking customers in their Internet search. My department has its official Internet Websites printout that is given out to our customers. Let me see, what can I say that is complimentary about my department’s Internet Websites printout? I like the color of paper that it is printed on, blue. After noticing an unfilled need for a useful list of job seeking Internet Websites, as a personal customer service project, about 5 years ago I created one on-line and have continued to expand and improve on it. I have yet to see anything like it. The list is at http://www.r-a-l-p-h.com/job-seeking.htm (And a copy of it is also at http://www.readmetoo.com). If you are viewing my job seeking Internet Websites on-line, because of the hundreds of hyperlinks I have already typed in there will be no need for the tedious chore of re-typing or copying and pasting of website domain name addresses into the address bar. I recently re-checked all of the hyperlinks, added many more, e-mailed the availability of my job-seeking webpage to all of the employment services employees in my department and received compliments about my webpage and suggestions of websites to add to it. If I was unemployed and learned of this useful job seeking webpage, I would be using it daily in my job search. I am a Park Mediterrania homeowner with some concerns that were ignored by both the previous Board of Directors and Euclid Management so I first expressed them in letters and flyers that I distributed five times door-to-door. One of the times, during the asphalt paving, I knocked on the doors and spoke with about 70 of the residents who almost all were very unhappy about the board and Euclid. After Alex Taylor, the previous President, at the 4/29/04 Board of Directors meeting discussed his Budget Analysis and admitted his board had mismanaged the money, I decided another way to express my concerns would be to start up this web site and have many pages of information up for your viewing. As you know the web site was advertised by taping on all the mail box doors calling cards describing it and also flyers on the sides of the mail box stands. I want to have many pages of info up for your viewing. Please come back regularly for updates. If anyone has any information they want to contribute to this web site or has noticed any factual errors, please contact me. Thank you for the supporting e-mails that I have been receiving at my new e-mail address. I also was active in going door-to-door with committee members gathering signatures on the petition requesting the Special Meeting of the Members to vote on removal of the previous Board of Directors, personally handed to the past President of the Board our petition, authored the 8/12/04 letter to the homeowners giving Some Reasons for Removal of the Board of Directors, created the proxy on the back of the letter and went door-to-door with committee members gathering signatures on that proxy. On 9/9/04 the Park Mediterrania Homeowners Association Special Meeting of the members was held. The members voted 86 to 7 to remove (recall) Alex Taylor’ Board of Directors and elect our slate of candidates. When the new Board of Directors received their information packet prior to our first meeting, I noticed the Homeowners Association was so broke the last time the utility bills were paid it was not in full, but only partial payments. 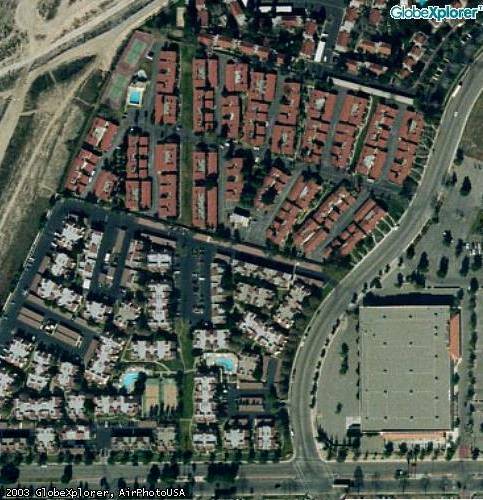 The following picture is an aerial view of Park Mediterrania Homeowners Association in between Casa Mediterrania Apartments at the top and Cottonwood Ranch Apartments at the bottom. 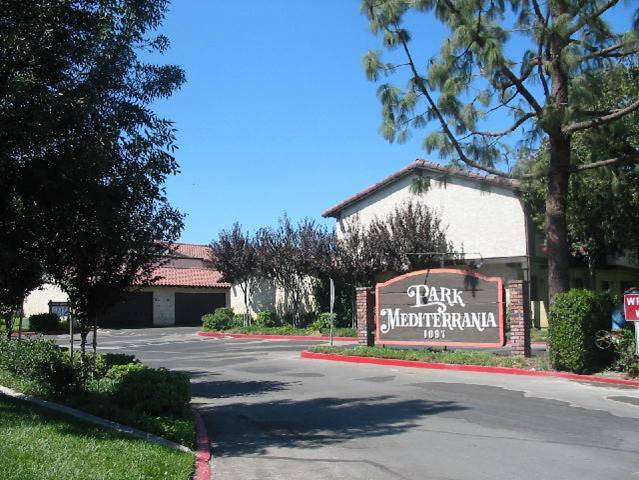 The following picture is Park Mediterrania Homeowners Association entrance sign with 1097 on one side and 1077 on the other. Dumb. People driving down the street looking for one of the two numbers have a 50-50 chance of seeing it the first time they see the sign. Dumb. If they miss seeing the number they are looking for and turn around to look for it again, when they finally see it on the other side of the sign they probably wonder how they missed it the first time. After noticing only one of two address numbers on the sign, newcomers turning into the driveway are not looking for the signs showing one address number on one side of the driveway and another address number on the other side. I have had people ringing my doorbell who thought they were at the Unit 69 number they were looking for, unaware there is a second Unit 69 on the other side of the driveway. I have had people phoning me and asking why I was not answering my doorbell. I have found outside my door packages for the other Unit 69. New newspaper carriers have delivered my paper to the other Unit 69. Common sense should make it obvious both numbers, 1097 and 1077, need to be on both sides of the sign. 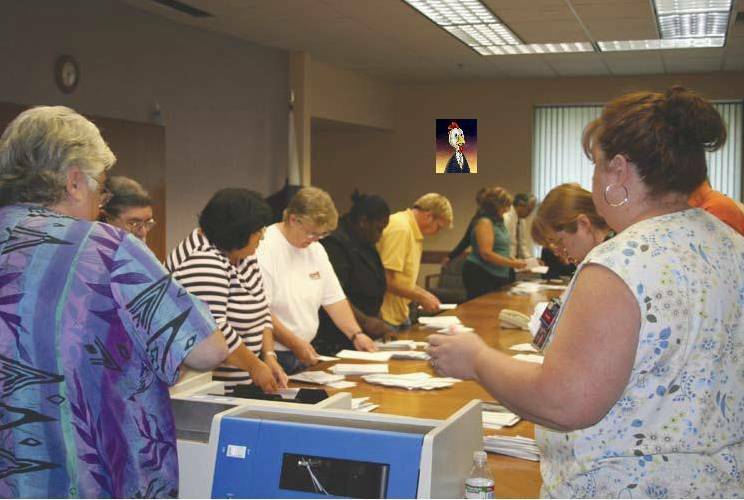 The following picture is of the SBPEA Board members, Bargaining Team members and volunteers counting contract ratification ballots in 2008 either in July during the initial voting by all of the 8 bargaining units or later in August during the revote by just the 4 bargaining units who voted NO during the initial voting. The revote was illegal, because there were no changes in the proposed contract and also, because the 4 bargaining units who (supposedly) voted YES the first time were denied the opportunity to revote again too. The results of the revote were an unbelievable reversal of the initial vote leading a reasonable person to believe fraud had occurred. Are you a San Bernardino County employee and are dissatisfied with administrative county officials? Keep your opinion to yourself or you too may face suspension as Sharon did, because of her Blog. Are you a San Bernardino County employee and are dissatisfied with the representation from SBPEA? Are you a San Bernardino resident and are dissatisfied with the representation from elected county officials? Hey, are you not a dissatisfied employee or resident and just want to read some interesting local news? The following are just some keywords from my web pages in the hope crawler-based search engines will index them too. Oh, I almost forgot to include the word fishing.